COLEMAN, Fla.—On a special Saturday, inmates at the Coleman Federal Correctional Facility were honored by the presence of the Nation of Islam Student National Prison Reform Minister Abdullah Muhammad, who was accompanied by Student Minister Ali Muhammad of St. Petersburg, Fla. The Brothers of the N.O.I. at the Coleman Correctional facility (C.C.F.) were in full force, as well as fellow inmates who attended the event to hear the life-giving teachings of the Most Honorable Elijah Muhammad under the leadership and guidance of the Honorable Minister Louis Farrakhan. The event kicked off with Student Minister Ali Muhammad’s exhilarating words of introduction that served to heighten the audience’s anticipation as he enthusiastically laid out the white carpet for the principal speaker. 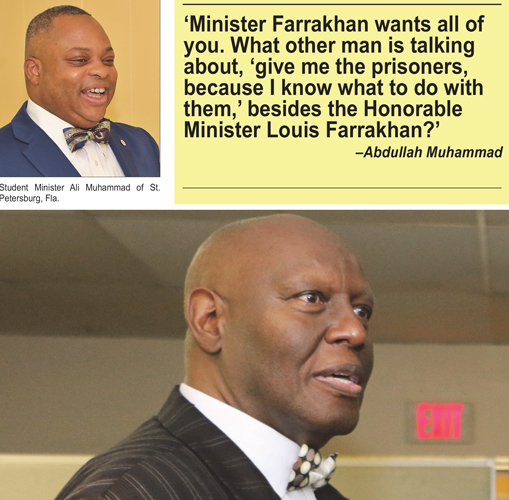 He noted Student Minister Abdullah Muhammad’s tireless efforts in helping Minister Farrakhan to reach and reform the Black man and woman in America, and particularly, those locked away in the prison system of the U.S. that presently houses 25 percent of the world’s prison population. Student Minister Abdullah Muhammad began by methodically showing the relevance of the prophets from the past and how they are merely signs that relate to Black people today. Using the prophet Moses as an example, the National Prison Reform Student Minister explained how Moses was raised from among an enslaved people, and Black people in America are in a similar condition to the children of Israel. Student Minister Abdullah Muhammad urged the Brothers in attendance to search the scriptures for guidance to the perplexing problems that are plaguing society and the world at large. He made it plain by simply stating that those prophets and messengers in the Bible and Qur’an served their purpose and aren’t physically present, but Blacks are not forsaken. A Messenger has been raised from among Blacks who is sounding the trumpet of salvation and inspiring Black men and women throughout America to seek unity for self-determination and upliftment. Student Minister Abdullah Muhammad cited as examples of the power of unity the Justice or Else! Movement which inspired a boycott during the Christmas holiday season of 2015, in protest of the number of Black people being killed by police, mass incarcerations, and systemic racism. As a result of the boycott, there were heavy monetary losses on major corporations such as J.C. Penney, Walmart, and Apple, which led to closures of stores and the loss of stock values. Out of this Justice or Else! Movement came the 10,000 Fearless, which is brothers and sisters who have decided to stand in between the gangs and guns by peacefully resolving these conflicts to make Black communities safe for our women, children, and elderly. The down-to-earth lecture resonated with the crowd as Student Minister Abdullah Muhammad shared some of his personal experiences, allowing us to see that numerous Black families have been impacted by the criminal justice system, regardless of stature in life. His message was sobering, yet at times filled with humor and laughter, which only served to keep the audience’s attention as listeners applauded and cheered in agreement with the timely delivery. Student Minister Abdullah Muhammad implored listeners to be unafraid to challenge themselves to bring out the divinity and greatness that lies within. Inmates at the Coleman Correctional Facility give praise to Allah for the appearance of our beloved Brothers, Student Minister Abdullah Muhammad and Student Minister Ali Muhammad.